I always knew I would run a business, but I didn’t always know it would be about portraits. The light bulb for that life path came on when I was reading up on how to really USE my camera after my first niece was born. I got completely lost to the world, nose buried in 3-inch think textbooks, following link after link (looking for the end of the internet, as my husband liked to call it), signing up for classes, and it suddenly clicked for me: I could not imagine getting tired of learning more about the art of photography. There are the technical aspects of camera settings, understanding the complex properties of light, and probably most important for portraiture, learning how to work with subjects to get them comfortable and be able to portray them in a way that’s true to them. So much to learn, you could never be finished, and I was never going to get tired. This was going to be my business. That was 9 years ago now, but the rest (as they say) is not history, unless it’s history repeating itself. I am still growing, learning, improving, and loving it. 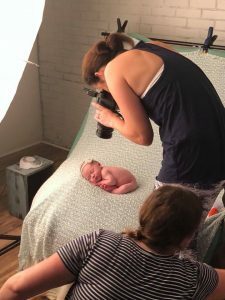 And I recently had the opportunity to learn in the most rewarding way possible… alongside a group of incredibly talented, impressively supportive fellow newborn photographers. One of my business goals this year was to attend an in person, hands on, newborn photography workshop. 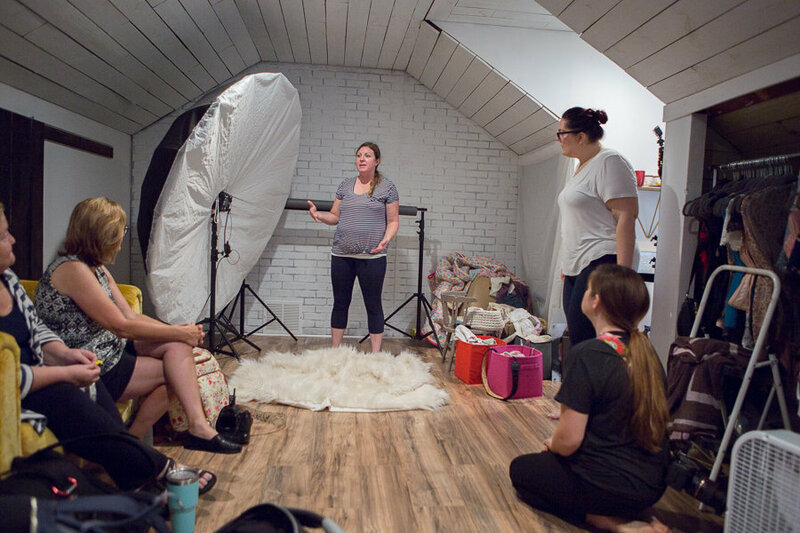 After a lot of research, I narrowed it down to Blissful Baby Workshops, mainly based on their glowing client reviews among other photographers, and the covered curriculum which hit on areas I was interested in growing. I spoke with one of the photographers and co-owners, Janean Gray, beforehand to make sure it would be a good fit for my current skill level. She was thorough, candid, and approachable, and helped guide my decision. So I dove in, and I’m so glad I did. The workshop was everything I was hoping it would be. When you have a solid foundation of years worth of practice to build on, it’s amazing how quickly you can make leaps and bounds beyond that with a little instruction from someone who is ahead of you in the same journey. Watching first hand and hands-on through a full example of someone else’s workflow was eye-opening. I realized ways and places I could tweak my in-studio workflow to better accommodate my newborn clients and their parents. Same results, better process! It was also illuminating to walk through each shot side by side and compare the different results achieved by the smallest adjustments of angles. I walked away with my brain full of ways to tweak and rework my current practices for better images, better client experience, or more efficient processing. I have always loved learning something new. And since both photography and entrepreneurship are topics encompassing a huge body of knowledge, there will always be something new to learn. Ways to grow and perfect my craft, and ways to grow and invest in my business. I’m so thankful for this opportunity to invest in myself, my interests, my passion. And I will most definitely keep this as a key business goal in future years. If you are considering diving deeper into something you enjoy, or something you do for a living (and if that’s the same thing, consider yourself so blessed! )… I encourage you to do so, from the bottom of my heart. It’s never too late to keep learning. That looks like a fun workshop! Never stop learning! Hands on workshops are a fantastic way of improving your skills in the wonderful art of newborn portraiture. This sounds like a fantastic workshop, so much fun! YOur journey sounds fascinating and inspiring. Loving what your learning and always building skills is key. Thanks for sharing! 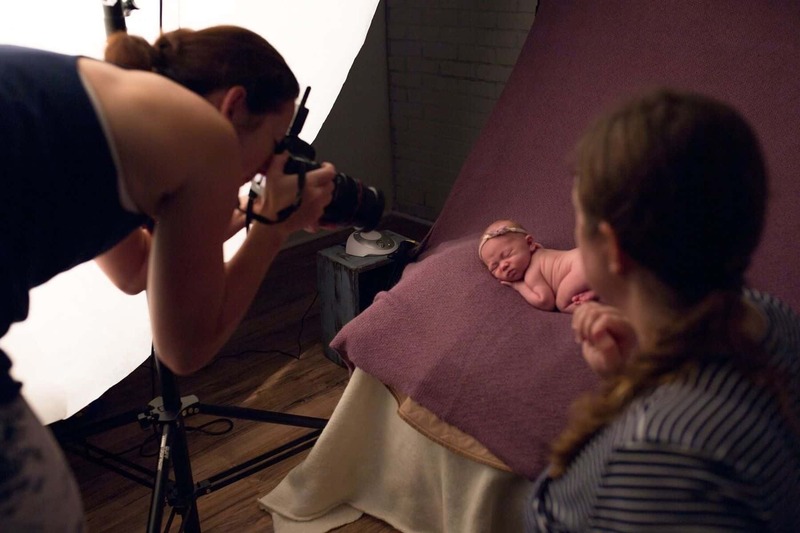 It’s so much fun and such an awesome experience being part of a newborn photography workshop! That’s awesome you were able to take the Blissfull Baby course. Photography education is really important.